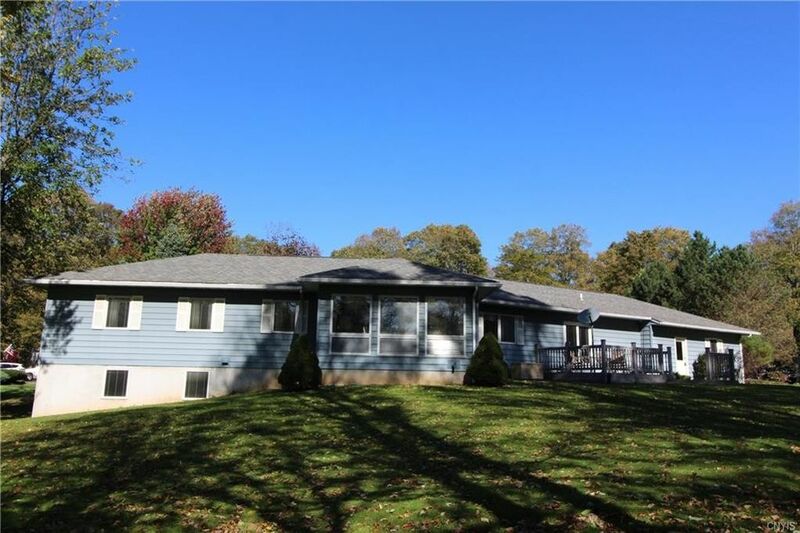 This executive ranch located at the end of a Village cul-de-sac is in one of Elbridge's most popular neighborhoods. The 1+ acre site has no residence behind; you will feel like your living in the country with all of the Village conveniences just a short stroll away. Rear deck overlooks a picture perfect backyard. Expansive living rm and open flr plan make this home ideal for entertaining. The modern eat-in kitchen boasts cherry cabinets, solid surface counter tops, recessed lights, and a built in sub-zero refrigerator. The owner of the property was an engineer; when the property was built he included upgrades like extensive insulation and 400 amp service that were not common at the time. The two step entry and no interior steps makes this home ideal for family members of all ages. Directions: Route 5 to Elbridge 4 Corners to South on South Street to Right on Sylvan.